Senior Kyle Rau is a favorite for the Mr. Hockey award this winter (Photo by Tim Kolehmainen). Dan Molenaar remembers sitting in a Target Center locker room, wondering where it all went wrong. 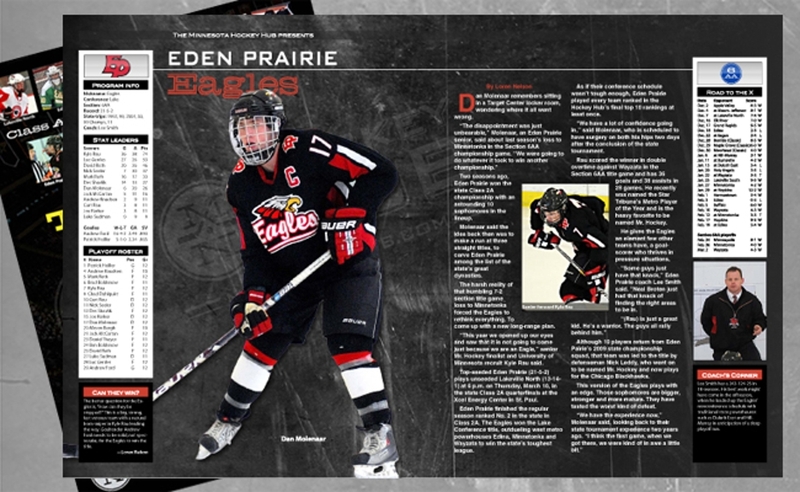 Two seasons ago, Eden Prairie won the state Class 2A championship with an astounding 10 sophomores in the lineup. Molenaar said the idea back then was to make a run at three straight titles, to carve Eden Prairie among the list of the state’s great dynasties. The harsh reality of that humbling 7-2 section title game loss to Minnetonka forced the Eagles to rethink everything. To come up with a new long-range plan. “This year we opened up our eyes and saw that it is not going to come just because we are an Eagle,” senior Mr. Hockey finalist and University of Minnesota recruit Kyle Rau said. 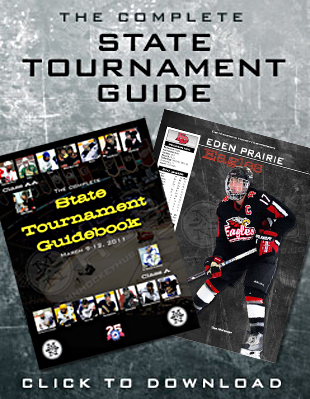 Top-seeded Eden Prairie (21-5-2) plays unseeded Lakeville North (13-14-1) at 6 p.m. on Thursday, March 10, in the state Class 2A quarterfinals at the Xcel Energy Center in St. Paul. Eden Prairie finished the regular season ranked No. 2 in the state in Class 2A. The Eagles won the Lake Conference title, outdueling west metro powerhouses Edina, Minnetonka and Wayzata to win the state’s toughest league. As if their conference schedule wasn’t tough enough, Eden Prairie played every team ranked in the Hockey Hub’s final top 10 rankings at least once. “We have a lot of confidence going in,” said Molenaar, who is scheduled to have surgery on both his hips two days after the conclusion of the state tournament. Rau scored the winner in double overtime against Wayzata in the Section 6AA title game and has 36 goals and 38 assists in 28 games. He recently was named the Star Tribune’s Metro Player of the Year and is the heavy favorite to be named Mr. Hockey. He gives the Eagles an element few other teams have, a goal-scorer who thrives in pressure situations. “Some guys just have that knack,” Eden Prairie coach Lee Smith said. “Neal Broten just had that knack of finding the right areas to be in. 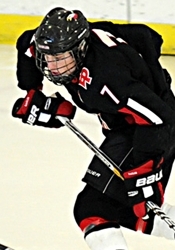 Although 10 players return from Eden Pairie’s 2009 state championship squad, that team was led to the title by defenseman Nick Leddy, who went on to be named Mr. Hockey and now plays for the Chicago Blackhawks. This version of the Eagles plays with an edge. Those sophomores are bigger, stronger and more mature. They have tasted the worst kind of defeat. The better question for the Eagles is, “How can they be stopped?” This is a big, strong, fast, veteran team with a natural born sniper in Kyle Rau leading the way. Goaltender Andrew Ford needs to be solid, not spectacular, for the Eagles to win the title. Lee Smith has a 343-124-25 in 18 seasons. His best work might have come in the offseason, when he loaded up the Eagles’ nonconference schedule with traditional state powerhouses such as Duluth East and Hill-Murray in anticipation of a deep playoff run.